The Affenpinscher has an energetic personality that has earned it the affectionate reference as a monkey terrier. This breed loves to monkey around and fits in best with a family that likes a high level of entertainment. The Affenpinscher does have many of the standard terrier characteristics, including being active, curious, courageous, and stubborn. A highly playful dog, the Affenpinscher can provide a lot of amusement. The breed tends to get along well with other dogs and animals. It does have a tendency to bark and sometimes to climb. The Affenpinscher is a high-energy and vigorous breed that needs a fair amount of regular exercise. These exercise requirements can be met with an eventful play session indoors or outdoors or a decent walk on the leash. It is best suited to live in an indoor environment, but should have access to the outdoors for play purposes as well. The coat of the Affenpinscher requires only minimal maintenance, with combing a few times per week. Shaping of the coat will need done approximately every three months. The shaping of the coat of the Affenpinscher should be done by clipping for a house pet or stripping for a show dog. 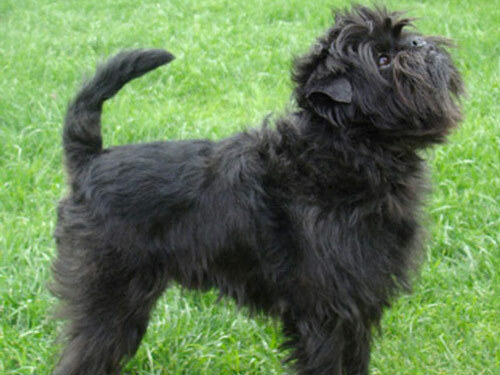 The name Affenpinscher comes from the words Affen, which means monkey, and Pinscher, which means terrier. It has been commonly referred to as the monkey terrier because of this. The Affenpinscher is referred to as the mustached little devil, or the diablotin moutaschu. The origin of the Affenpinscher is unclear, but it is believed to be one of the oldest toy breeds in existence. This belief comes from paintings from the fifteenth century of Dutch origin that pictured dogs that resembled the Affenpinscher. However, any further evidence of their early day existence does not exist. During the seventeenth century, small terrier dogs were used to get rid of rats in central Europe. These small terriers were also used in Germany to remove rats from the stables and kitchens. In the household, these dogs were preferred by the lady of the house to rid the home of mice and act as an entertainer and lap dog. These small dogs eventually became known as the Affenpinscher. In later times, they were crosses with the Pug, German Pinscher, and German Silky Pinscher and eventually assisted in the creation of additional wire coated toy breeds. The Affenpinscher had the most popularity in Germany and became recognized by the AKC in 1936. However, after World War II, the breed became less popular and is barely seen today in America or Germany.